Hey everyone! This week, I thought it would be fun to play around with scapy. Scapy allows you to manipulate packets to do basic things like port scanning or host discovery, but also things that might seem strange at first, like send malformed packets. You might want to do that if you were trying to test an application for vulnerabilities by trying to see how it would react to a corrupted packet or stream. 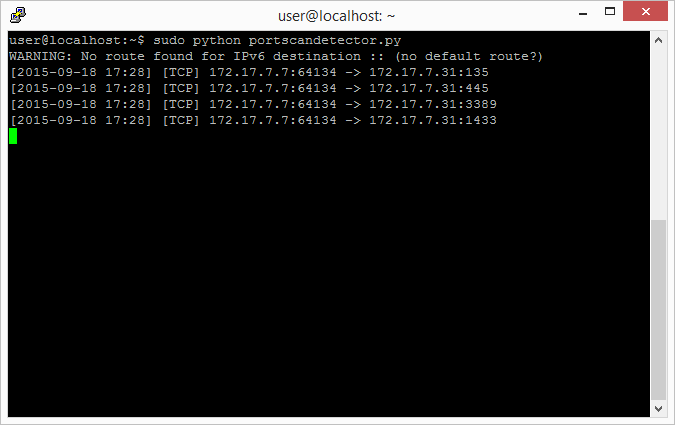 It is a really cool tool, and today, I am going to use it to implement a port scan detector. You might be thinking that an IDS / IPS would do this already, so what is the point of using scapy for detecting port scans? Part of it is learning how scapy works and what it can do. Since detecting a port scan is relatively simple, it is a good learning exercise. Does not respond to any packets it receives over the wire with a positive response. We want it to operate as silently as possible except for when it is alerting. Can alert us to when a port scan is happening. In my example, I had the script print an informative message to the screen about the packet. However, this could be extended to sending an e-mail or writing to a log. Does not take significant resources to run. It should be lightweight so that it could be deployed on a resource-limited piece of hardware (like a Raspberry Pi) or on a small VM (a few GB of hardware space and 512MB of RAM at most). This rule says to drop any packet on the OUTPUT (outbound) chain that is an ICMP echo-reply. In a nutshell, the script listens for any packets destined for it on any port (TCP / UDP). It also listens for any ICMP packets it receives (like a ping). 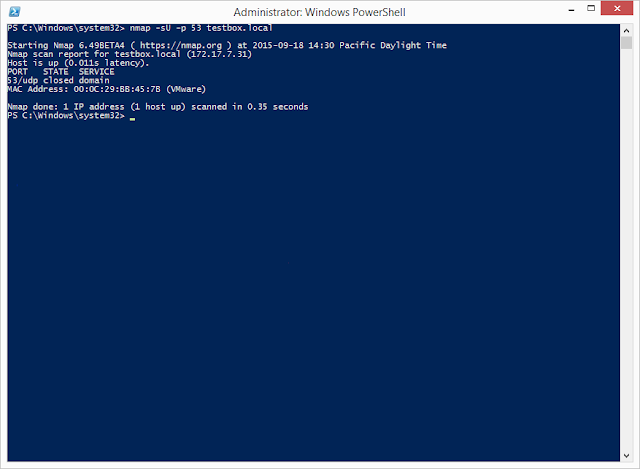 The VM is configured in such a way to not have any services listening on it (like SSH). When a port scanner sends a packet to the VM running the script, the Linux kernel sends an RST packet (to tell the scanning IP that the port is closed). The sniffer that the script is running sees the packet and makes a note of it (in this case by printing information about the packet to the screen). not meet specified conditions, then we return False. This function outputs basic information about the packet. We will start with the while loop. We set up a scapy sniffer to sniff the wire for us. If we hit Ctrl-C to stop the sniffer, we simply exit. Scapy creates a socket when it spins up the sniffer, and we have to be root (or Administrator on Windows) to create that socket. So if we get an error, we want to print a helpful message and exit. Line 121 is where the magic happens. This is where we set up our sniffer. Scapy allows us to set a sniffer for the packets we are looking for, limit the number of packets sniffed, and take action on each packet that matches the filter. We could leave the filter blank which means the sniffer could take action on every single packet, but we are not going to do that for two reasons. First, we do not want to capture the RST packets that are sent by the kernel for closed TCP ports. Second, scapy's filtering does not work so well with traditional filters on virtual machine interfaces which is what we are using. lfilter tells scapy to call the specified function to filter a packet. You could also use a lambda in here, but we are taking some actions that are a little more complicated than what we can put in a lambda. We will get to the filter in a moment, but I want to introduce the other two parameters we are using to set up our sniffer. The count parameter tells scapy how many packets to sniff. We have set it to zero here because we want to sniff all packets until the script is terminated. The final parameter is prn which tells scapy to call the specified function on every packet that matches our filter. The first thing we do is check to see if the packet is originating from our box. To do that, we have to ensure the packet is an IP packet. If it is not an IP packet, then our IP will not be in there (obviously). If our IP is the source of the packet, we return False which means this packet does not meet the criteria for filtering and should not be acted on by our prn function. If this function returns True, that means something about it met the criteria for filtering. In our case, we want to act on any TCP packet that is destined for any of the ports we define in the list above the function (tcpPorts), any UDP packet destined for the ports in the udpPorts list, and any ICMP packet. Any other packet is let go. In this example, we have two ways of defining which ports we care about. We can specify ports we are interested in, or we can specify all ports. The last part we will take a look at is parsePacket. This is the function that is called when a packet matches our filter. This function prints out the vital information about a packet (when it came in, what port it came in on (for TCP / UDP), and where it was destined). Scapy uses a Python dictionary to store information about a packet. I found the documentation to be a bit lacking, so I determined what part of each kind of packet I wanted by capturing some packets and printing them to the screen. Once I figured out what fields I wanted, I extracted them and printed them to the screen. You could send an e-mail or write to a log file (which could then be picked up by something like Splunk for centralized monitoring). I tried some common Windows ports, and as expected, the Linux kernel sent an RST back to the Windows box because the ports are closed. On the Linux side, we see the script saw the packets. We could make the script do more advanced things like alerting us. If I were to extend this script, I would like to find some way to suppress the TCP RST packets that are sent by the kernel so that the box would not appear to alive. Blocking outbound TCP RST packets using iptables makes nmap realize the port is being filtered because nmap knows the box is up, so if it sends a packet and does not get a response, it assumes it is filtered. Another way would be to block ARP (the mechanism nmap uses to tell if a box is up), but that would make it difficult for the box to communicate. If you have suggestions, please let me know. So that is our fun with scapy for now. Have you used scapy for any interesting projects? I would like to hear about them, so please let me know. Thanks for reading!